Clemson Tigers running back Travis Etienne scores a touchdown during the second half against the Syracuse Orange at Clemson Memorial Stadium. Tigers won 27-23. Mandatory Credit: Joshua S. Kelly-USA TODAY Sports. 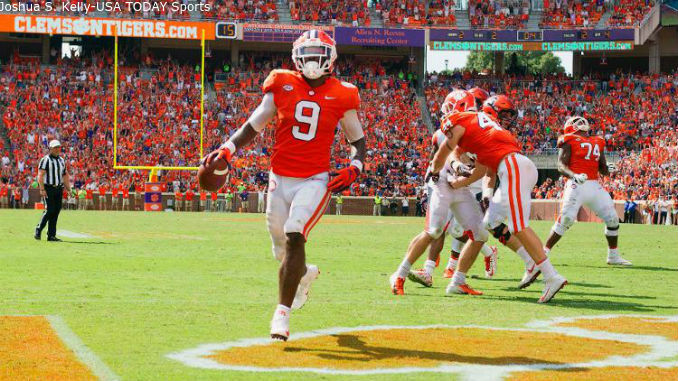 WHAT HAPPENED: Travis Etienne’s third touchdown of the game with 0:41 to play crushed the Orange who came ever so close to an eye-opening upset win. Until Tigers backup quarterback Chase Brice directed the winning 94 yard touchdown drive, Eric Dungey was on course to direct one if the biggest wins in school history. The Syracuse (4-1, 1-1) defense was worn down by a Clemson (5-0, 2-0) rushing attack that finished with 293 yards, and just couldn’t make enough big plays to get off the field. The loss may keep SU out of the Top 25 polls, but it was certainly a terrific effort and clearly shows there’s no team that the Orange can’t defeat in the remaining seven games. ANALYSIS: Syracuse made enough big plays to win, but not in the second half. The Orange rushing attack was stuffed all day finishing with just 61 yards, and while Dungey had 26 completions for 250 yards, the Orange had to settle for three Andre Szmyt field goals instead of touchdowns in the first half, proving to be points the Orange would need later in order to hold off a Clemson second half comeback. Otherwise, the ‘Cuse special teams performed well, with a tip of the hat to punter Sterling Hofrichter who pinned CU deep often, finishing with seven punts for 340 yards, a 48.6 average, three boots over 50 yards, and four kicks inside the 20 yard line. HEROES: Eitienne was virtually unstoppable finishing with 203 yards on 27 carries on the ground, and Brice, who began the week as the third string quarterback and replaced an injured Trevor Lawrence (apparent head injury in the second quarter after a hit by SU’s Evan Foster), settled down and had a memorable fourth quarter, including a fourth down conversion 20 yard pass along the way, leading the comeback victory. ZERO: Too many mental mistakes continue to hamper a team looking to emerge in the ACC. Whether it was a turnover, penalties, or failure to keep the chains moving, this was a game the Orange players and coaches are left shaking their heads knowing they let an upset get away. One of the five key penalties was on an apparent gutsy fourth down pass play conversion from Dungey to tight end Aaron Hackett in the fourth quarter, negated by lineman Cody Conway ineligibly drifting too fast downfield, and the offense was just 3 of 15 on third downs. WHAT’S NEXT: Syracuse stays on the road next Saturday, Oct. 6, taking on Pittsburgh (2-2, 1-1) at Heinz Field. The Panthers are the annual opponent that SU has played most often, 73 previous times, with Pitt winning 13 of the last 16 meetings dating back to 2000, although SU won in the Dome last season 27-24. Pittsburgh played at No. 13 Central Florida Saturday following Syracuse’s game at Clemson. Game Time: 12:20 p.m. ET. TV-Radio ACCN-Sirius XM.